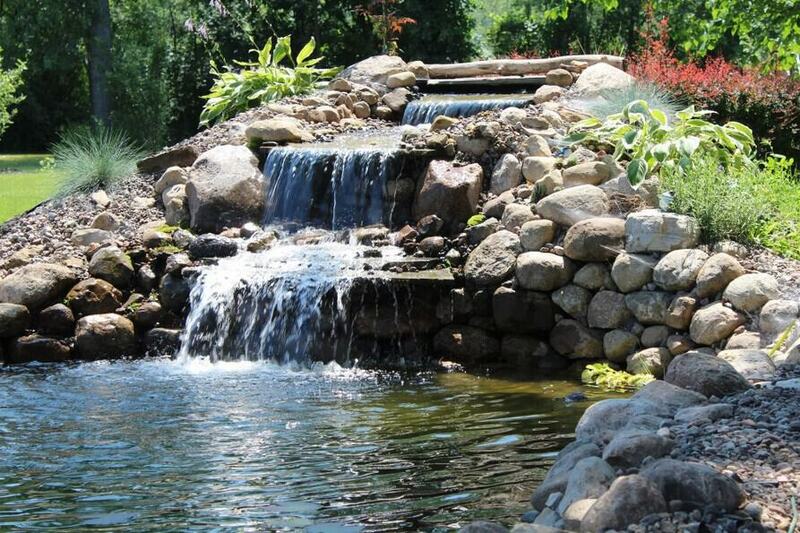 Backyard pond designs are a direct reflection of your personality and taste. 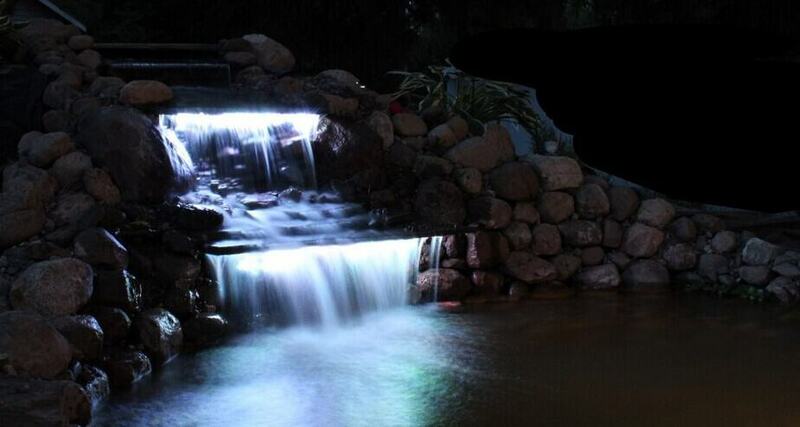 This is the time to let your creative ideas run wild and showcase your amazing water feature. Just like furnishing a new home, it’s time to add all the finishing touches that can really enhance your amazing creation. Fist things first. Be sure everything is hooked up correctly and is running smoothly before you go any further with your finishing touches. Make sure you have an audience, and a drum roll is a must! Turn on your pump and watch your backyard come to life as you add a new dimension to your outdoor space. At this time it’s a good idea to let your waterfall run for 24 hours before you go any further. This way you can be sure there are no leaks and nothing major needs to be addressed. In this section I will discuss the necessary steps that need to be taken to finish the project after that it’s up to you. That’s when you can let your creative side go wild. If you choose to surround your garden with garden gnomes, so be it. Let’s get started. At this point you’ve filled your pond and are running your waterfall, but the entire thing is bordered by wrinkled rubber liner. Take the excess liner and wedge it between two rocks, so that it is sticking up between them, then trim the excess. I know it sounds like common sense, but be sure your liner is higher than your water line, or you will have issues. This may be tough to see where the water flows down your waterfall. I used river rock on one side of the garden, and on the other side I added large flagstone. The flagstone provides an inviting walk up for viewing, and feeding the fish. 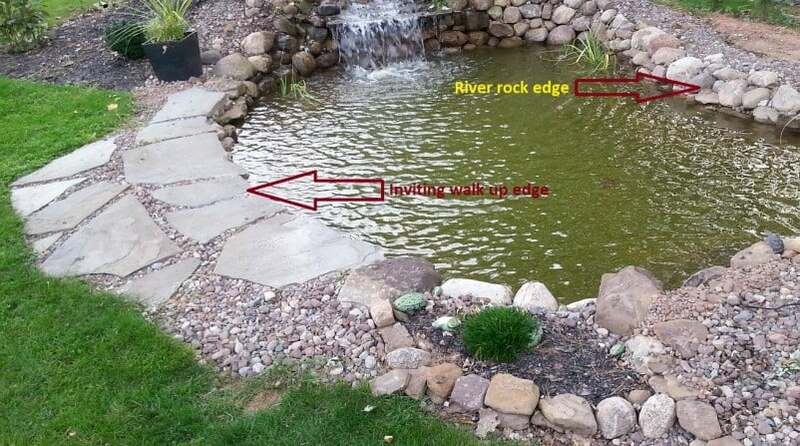 If river rock, or any kind of small rocks are going to be used around the edge, be sure to place landscape fabric under it. It will stop the small rocks from sinking into the ground. The fabric is also a great weed barrier. Weeds can be easily removed if fabric is used. 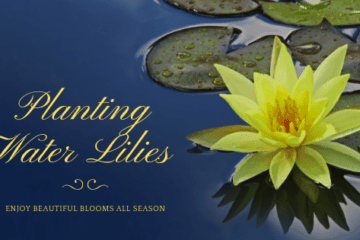 It’s important that there are enough plants planted in your pond. 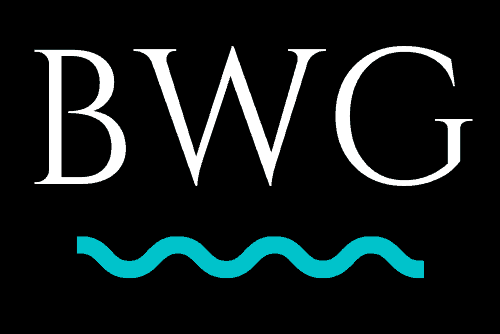 It is recommended that 60 percent of the water surface be covered with some type of vegetation. This controls the amount of nutrients in the water, starving any of the floating algae that may be present. This is one critical mistake that I made when finishing my water garden. The water started out crystal clear, but a few weeks later the water began to get murky, and by the end of summer the only time my fish were visible was when they would come to the surface for feeding. If my water surface had more plants to shade the water, and use more of the available nutrients, them perhaps this wouldn’t have happened. Another way to combat the threat of algae is by using a UV clarifier. It is nothing more than a tube with a UV light in the center. The water flows through the filter around the light. This light exposure breaks the cell wall of the algae, thereby destroying it. If your pond is in really bad shape it may take a few weeks before the water is clear according to the UV light manufacturer. Once the water is pumped through your filter media you are left with crystal clear water. I made the mistake of not installing one of these right in the beginning. Oh well, live and learn. If you aren’t going to have a heavily planted pond I suggest investing in one of these. I will be installing a UV light in the spring. This is key to achieve crystal clear water. Check my posts and I will give an update as to exactly what I did, and how well it is working. This is my favorite part. By adding the proper lighting you essentially create two environments. The pond you see during the day, and a completely transformed space at night. It maximizes your enjoyment when the sun goes down and really gives your garden new life. 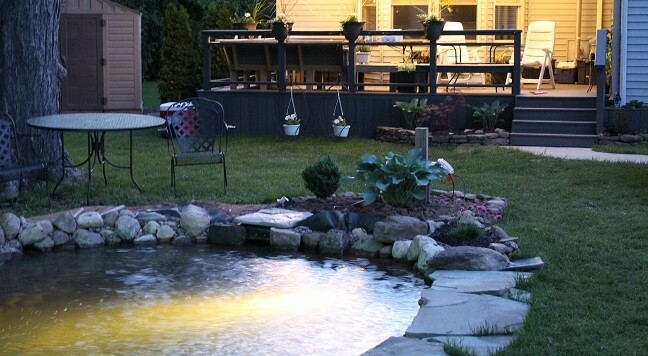 I have seen many backyard pond designs fall flat due to the lack of proper lighting. This is something you don’t want to skimp out on. Adding this new dimension changes everything. These have come a long way over the past few years. Their light output has increased tremendously due the technology of LED lights. From my experience they are not as reliable as a kit that is hard-wired. The trade-off is in the ease of set up. Solar lights can be placed just about anywhere as long as they are not in absolute shade, so if getting power to where you need to shed some light these may be your only viable option. I still prefer the low voltage lighting kits. These are perfect for the surrounding garden, and along pathways. Putting these on a timer is a very good idea. Some kits come with spotlights, for that “feature” in your garden. There are a range of price points for these lights. I purchased a kit with 7 lights and a photo cell control box. The photo-cell allowed the lights to turn on as soon as it was dark. There are low voltage also submersible lights. These can also be used in conjunction with a photo-cell thus making the whole system more automatic. On at dusk, off at dawn! This was an inexpensive set made of plastic. It worked great the first season, but once the winter was done very few of the lights still worked. Now if you don’t mind installing a new kit every year or so, this may be the way you want to go. You get what you pay for. I will be upgrading my price point for next time. This type of lighting is my favorite. Be sure the lights you buy are for outdoor use. Depending on your system, this type of lighting allows you to change the color to suit your mood, or for the different seasons or holidays. Why go out and “put up” the Christmas lights when, with the press of a button it is already done. Use plants around the edge as well to soften the appearance. The types of plants used will depend on what zone you live in. Use the hardiness zone map that the USDA publishes to determine if a plant is suitable for your area. 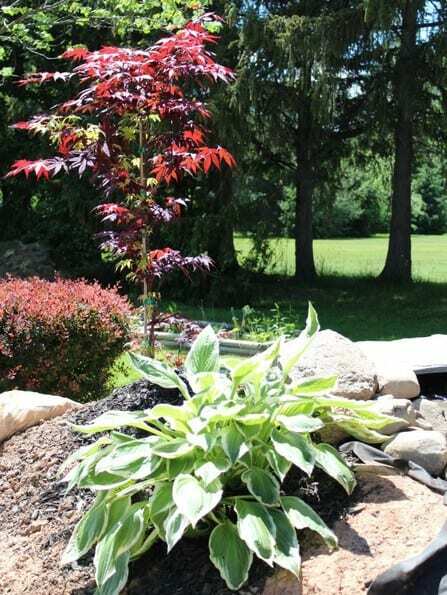 The plants add to the natural look of your water garden. Plants are a great way to hide the liner as well. Tuck your plantings right behind the liner to help hold it up. Not only are plants great to hide the transition from land to water, they are vital to achieve balance in a complicated pond ecosystem. They provide oxygen for fish and reduce the spread of algae. They also act as a natural water filter. 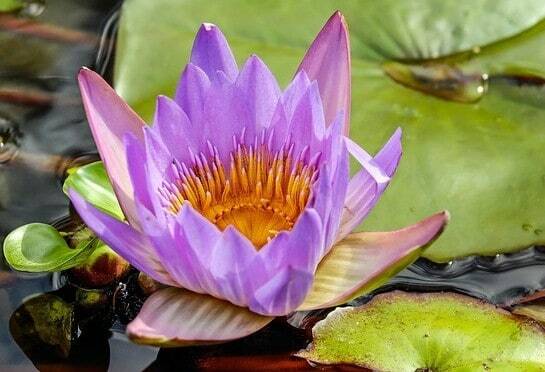 Water plants, such as water lilies provide not only shade, but also protection from predators. Giving your fish cover is essential for their survival, especially when they are small. Cattails are typical in my area, however it is not recommended to use them in a pond with a liner. These plants have been known to grow their roots right through it, causing leaks. How you want your outdoor decor is up to you. My wife is very crafty, and loves to add her finishing touches to things. 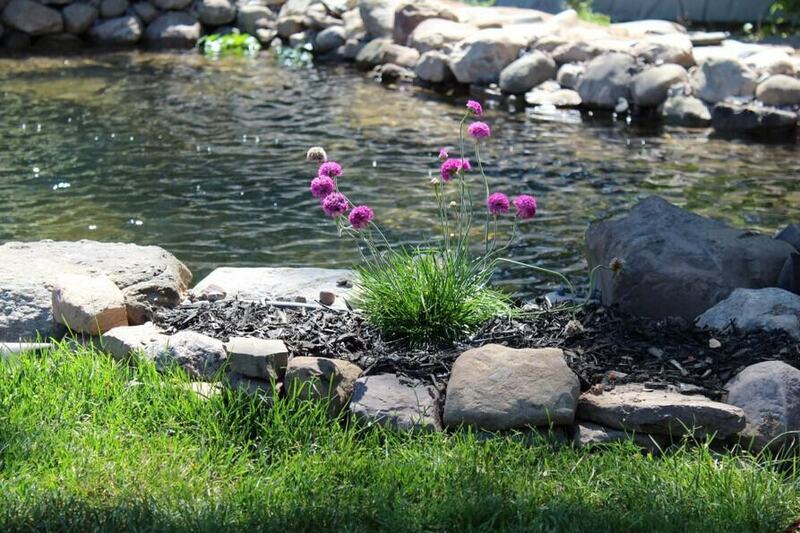 The rocks pictured add that little special personal finishing touch to the water garden. 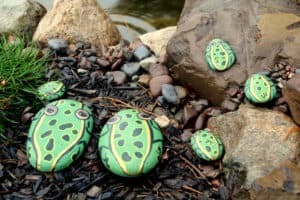 Rock painting is a great way to add your own flair to the landscape. Check out the link to see all sorts of cool rock painting ideas. It’s amazing how just adding a little something here and there can affect the whole look and feel of the space. The possibilities are truly limitless. 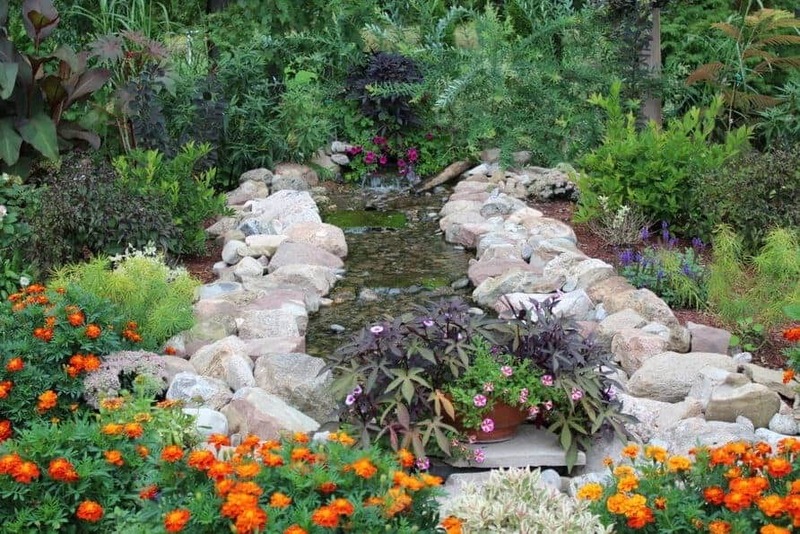 I hope you found this how to build a backyard water garden tutorial useful. Leave a comment below, and thanks for visiting. Enjoy your new at home getaway. If you have any questions, please don’t hesitate to leave them below and I will get back to you. Thank you for reading! Great pictures and you did a good job on the pond. I can imagine it is nice to set out by the pond in the evenings and listen to the water. Thanks, and yes. There is nothing better than sitting by the pond after a long day at work. Gorgeous…great work. Nothing better than relaxing to the sound of water. Yes, its the universal language of relaxation! 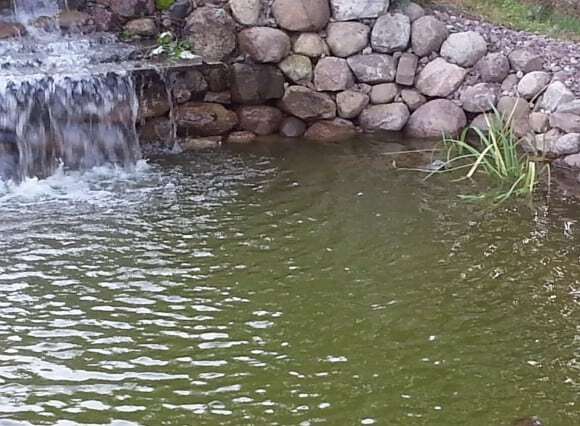 The pond turned out to be a very nice looking, well designed and engineered pond. I am curious though, what happens to the yard when a rainstorm occurs? Does your pond run over and flood the yard? Is there a proper way of installing a pond to prevent the yard from flooding? I live in Louisiana so we do get rain. Thank you for sharing your great pond. Thanks for reading. To answer your question, the skimmer box has a hole towards the top of it to to drain water off at a certain level. The pond will never overflow because of this. I don’t know what kind of rain you get in Louisiana, but if your whole yard is under water then you have a problem. Great question.